Disposable razors, razor blades, empty containers and jars, etc. are best thrown into out-of-reach trash containers and not in bathroom wastebaskets. Test older style homes for presence of lead paint. Cover all trash barrels securely and store them in a safe area. It’s best to store tablecloths away for the time that your children are older. Store hazardous materials such as fertilizer, halite and anti-freeze in an out-of-reach location. Place barbecues and cooking utensils, as well as garden tools and equipment in a safe area. Take a plant tour and identify each houseplant. Remove poisonous plants from your home. Since children learn by imitating, operate safety devices when your children are not watching. Read up! There are magazines, books and the internet to help. Get a good idea about what’s involved before you begin. Always empty buckets after use and avoid using them when children are nearby. Safety gates with a permanent style mount offer greater protection than pressure style gates which may be pushed over by children. Avoid stepping over safety gates which your child will try to imitate and which may cause injury to you. Check handrails to make sure they are installed securely. Install additional handrails if needed. Beware of plastic bags, especially dry cleaning bags. It’s best to dispose of them before entering your house. To help prevent stairway falls, install safety gates at both the top and bottom of stairs. Make it a habit to cook on rear stove top burners and turn all handles towards the back of stovetop. Also, avoid using pots and pans as toys as your child may try to pull a pot or pan from the stove while you are cooking. Remember, never leave your baby unattended. There is no substitute for adult supervision. Keep items such as shampoos, cosmetics, mouthwash, cleansers, razors, air fresheners and potpourri from children’s reach. Remove items such as perfumes, powders, health and beauty supplies, coins, jewelry and “breakables” from the tops of dressers. Remove all poisonous plants from your yard. For questions, call your local Poison Control Center. Keep purses in a safe area. Both the carrying strap and purse contents present hazards for small children. Check balconies and decks for loose railings. Also, check decks for splinters and exposed nails. Empty wading pools immediately after use and keep them turned over so that no rain can collect inside them. Keep emergency numbers next to your telephone. Begin to think about baby-proofing your home well before your child is mobile. You’ll have to anticipate your sitting baby crawling, walking and then running. Be prepared for the future! Install baby-proofing products before your child is mobile. This helps you become accustomed to using them and will help prevent injuries. A good time to do this is when your baby is between 6-8 months. 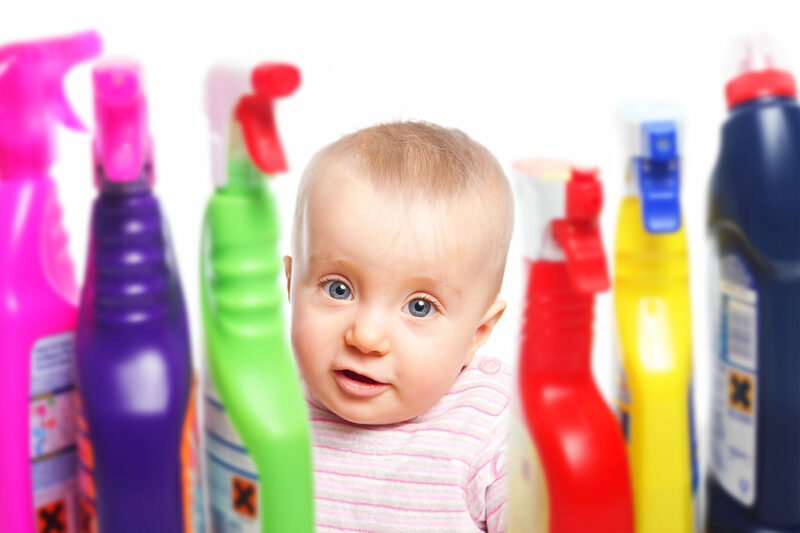 Childproof your home once, and do it thoroughly. Give your baby a safe environment to explore before she reaches the next developmental stage. Beware of using second-hand or borrowed items, especially cribs. The Juvenile Products Manufacturers Association advises against it. According to the Consumer Products Safety Commission report, crib accidents are the leading cause of death involving infant products. Regularly dispose of old medications by flushing them down the toilet. To guard against scalds, lower your household water temperature to 120ºF.